In smart rooms, light-emitting diodes (LEDs) are used for visible light communications. 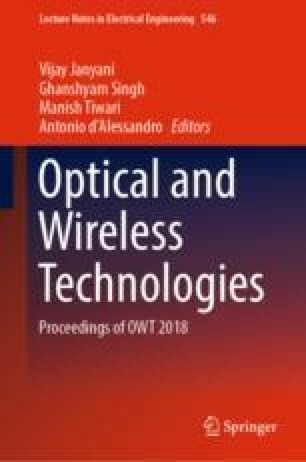 In this communication process, it is observed that there is uneven distribution of received optical power and signal-to-noise ratio (SNR) on the same receiving plane. This affects the performance of the LED panel as some of the LEDs have to transmit more power to the get connected to the far away receivers. Here, this is developed as an optimization problem, i.e., optimization of received optical power and SNR together by controlling the distance between LED panel and receiver. The optimization is performed by genetic algorithm. A case study is presented for a 5 m × 5 m × 3 m size room with a single 4 × 4 LED panel placed at the center. Simulation study reveals that after optimization there is almost uniform optical power distribution and SNR in the same receiving plane.